Welcome to International Coach Federation Cleveland! 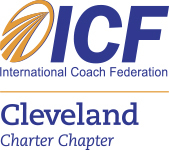 The International Coach Federation - Cleveland (ICF Cleveland) welcomes all professional coaches and individuals seeking to learn more about coaching. We are a membership organization with the purpose of advancing the art, science, practice, standards and ethics of professional coaching. Our membership is diverse and representative of the emerging field of coaching. Whether you are new to coaching or an established professional, ICF Cleveland is your best resource in this growing and evolving field. ICF Cleveland promotes an awareness of coaching throughout the business community. We provide learning opportunities and other resources to practicing and aspiring coaches who are focused on growing and enhancing their skills as well as expanding their practices. Our members support the standards and ethics of the International Coach Federation (ICF-Global). ICF Cleveland is comprised of professional coaches working with individuals and within organizations. We represent a variety of coaching specialties including executive and small business coaching, personal coaching, corporate coaching, and coaching for individuals with special needs. ICF-Cleveland meetings and events are open to both members and guests. We invite you to participate in our powerful networking events offering opportunities to empower and support new, as well as experienced, coaches. If you are not a member, learn more about membership in ICF-Cleveland. Join us and experience the potential of coaching through career-enhancing monthly programs. If you are looking to hire a coach, please visit our Find a Coach section.